Starting this July, we are excited to bring an all new monthly Celebrity Guest Feature as part of our fitness section. Our guest feature writer is none other than an extremely popular and respected Indian Holistic Health Guru. Yes, we are talking about none other than the leading expert with over more than 25 years of experience in the field of fitness - Mickey Mehta. The renowned health guru has a huge list of celebrity clients who swear by his teaching which includes Priyanka Chopra, Priety Zinta, Bipasha Basu, Lara Dutta, Smriti Irani and many more. A philosopher, life coach, an author and a fitness guru, Mickey Mehta has revolutionized health with his philosophies of zen, tao, tantra and ved, and blended the disciplines of exercises such as calisthenics, functional training, boot camp, agility drills, tai chi, pilates, yoga and swimming. We are extremely delighted to have Mickey Mehta on board as the Celebrity Guest Writer, who will be providing fitness tips and answering reader queries every month on Diary of a Dancebee. This month, we got the Health Guru to talk about beneficial Monsoon Workouts. A splash of cool rain drop on your face no doubt brings in a sense of relief from the scorching summer heat and makes you swoon with joy. It is a season to rejoice and enjoy the beauty bestowed by the rain God on mother earth. But this season tends to be the most difficult one for the fitness addicts. Unlike other seasons, during Monsoon, it not only becomes quite difficult to step out on rainy days but it also gets tough to cater to ones fitness needs. In this month's feature, I have put together some great exercises, especially for the ongoing monsoon season, that one can practice at home, without taking the trouble of traveling on rainy days. An indoor jog on the spot or around a house jog serves as a great warm up exercise and can be extremely beneficial. This is one important way to shed off the extra fat. Push ups serve as a complete body exercise and can be easily modified in order to make it more challenging for your body. Sometimes, even the most avid exerciser can find several reps of this exercise tough. For fitness enthusiasts who feel that a regular push up is too easy for you, try the Single Leg Push Up. One of the best exercises during monsoon is Burpees. This exercise serves as an intense, full body workout, and helps burn tons of calories. 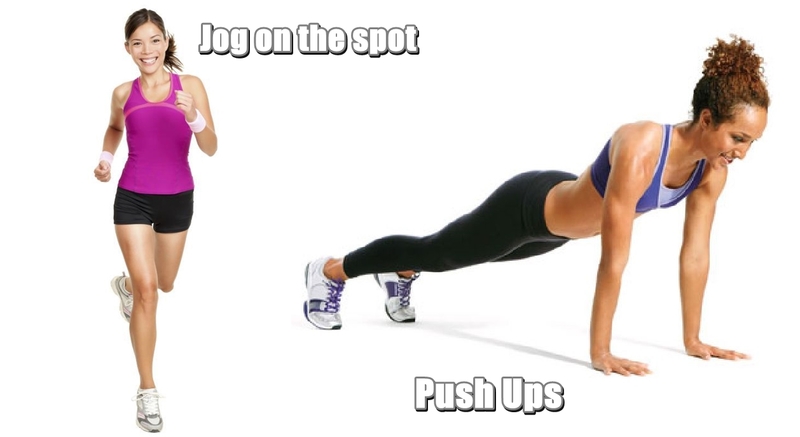 Burpees helps in increasing the metabolism rate as well. They are ideal for developing conditioning and endurance. Lunges serve as an excellent thigh toning exercise. 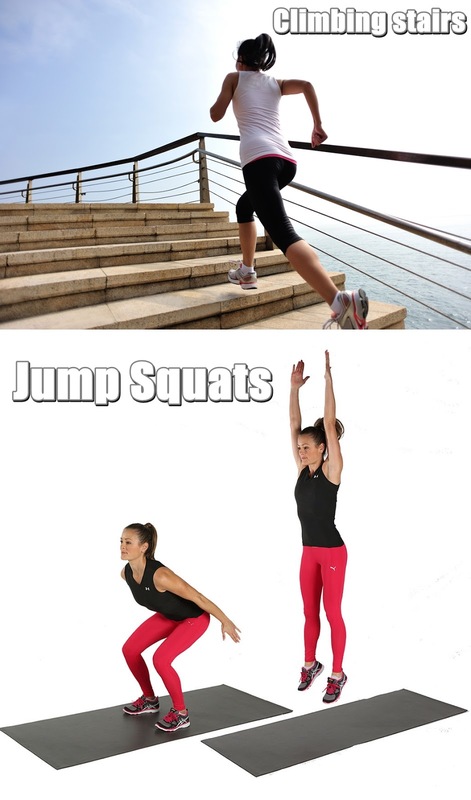 Add to that, jumps between these lunges and the entire exercise form - Jumping Lunges - turns into an incredible calorie burner. It also helps keep your legs toned and fit. The stairs in your building (home or office) serve as a superb exercising device by themselves. Walking up and down the stairs in between work is absolutely perfect for those who spent hours in front of the computer. Do a regular squat, then jump as powerfully as you can (reach up for the ceiling or sky). Jump Squats not only help in burning more calories, but also helps keep your legs fit and pushes you to challenge yourself for more. 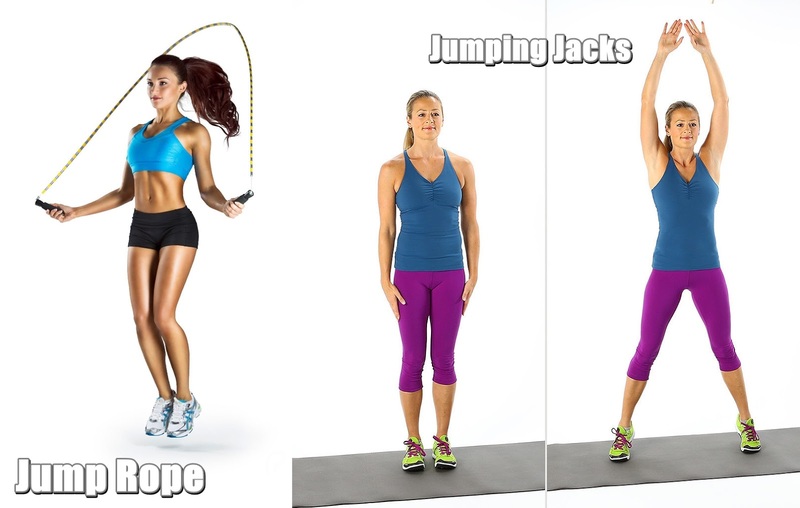 Jump roping is an amazing and simple workout option. There is no end to the tricks and variations you can do with a jump rope. Not only jump rope is a good exercise, but it also helps you work on co-ordination and balancing your body. Jump roping burns a lot of calories and is also the cheapest form of exercise. No frills! Just a jump rope in your hand and you are good to go. Jumping jack is a structural workout. It is a full body workout and strengthens your core muscle very well. It also serves as a good warm up exercise. It is an effective exercise for the joints and also helps strengthen them. Practicing Yoga on a regular basis is a must. Yoga is an incredible form of exercise that can be performed both indoors and outdoors. Select an airy, clean spot in your house, bring out your Yoga mat and practice simple asanas to keep yourself fit. Start with the basics like Pranayam, and slowly, move on to asanas like the Surya Namaskar. Yoga also helps diminish respiratory problems that are very common during the monsoon season. Everybody loves dancing. And if you are someone who swears by it, then dance like no one's watching. Dance is an incredible form of exercise, who not only helps keep you fit, but also makes your body more flexible and free. Choose your favorite music and dance genre, and burn calories without having to worry about hitting the gym on a rainy day. Make fitness and wellness a part of your daily lifestyle. A dash of discipline, good food habits, regular exercises, combined with adequate sleep, rest and relaxation and a graceful attitude will surely get you rejuvenated, revitalized and Mickeymized this Monsoon!